This page contains some general tips, and guidelines, to help you improve as a Pac-Man player. Most of these tips are geared for survival, not high scores. High scores can only be achieved when you know how to keep Pac-Man alive for a long time, so you should focus on becoming a better player before you go after that perfect game score of 3,333,360 points. Power Pellets: These are marked by the green dots in the diagram. They provide Pac-Man with the temporary ability to eat the ghosts and earn extra points. After eating a ghost, his eyes will return to the ghost regenerator in the center of the maze and instantly regenerate. You can still be killed by a regenerated ghost even though the other ghosts may still be blue. As the rounds increase, the time period that the ghosts stay blue (generally) gets progressively shorter. Eventually the ghosts do not turn blue at all (but will still reverse direction). Tunnel: Indicated by the light blue bar, the tunnel allows Pac-Man and the ghosts to instantly warp from one side of the maze to the other. While traveling through the tunnel, Pac-Man moves at his normal speed, but the ghosts are reduced to half speed. This provides Pac-Man with good opportunity to put some distance between him and his pursuers, but be careful not to get trapped by another ghost entering from the other side. Bonuses: Bonuses initially take the form of fruit, and later on become various items. They always appear where the white dash is beneath the ghost regenerator. Two bonuses will appear on each round, the first when 70 pellets have been eaten, and the second when 170 pellets have been eaten. While they can help the player achieve higher scores, their consumption should only be attempted when the coast is clear for you. Ghost Patrols: When the round first starts, each ghost travels to his respective corner and patrols the area until they all decide to hunt for Pac-Man. After hunting him for a while, they will periodically return to patrolling for a brief period of time. Each ghost's patrol area is indicated on the map by his respective color (Shadow/Blinky: red, Speedy/Pinky: pink, Bashful/Inky: cyan, Pokey/Clyde: orange). "Blind" Alleys: The purple areas in the diagram are special. In these alleys, the ghosts are allowed to travel down, but not up. For example, if you are being chased around the ghost pen, and you travel up one of the purple lines above the pen, the ghosts will not be able to follow you. One important fact to keep in mind is that Pac-Man moves slower when he's eating pellets than when he's moving through a clear alley. 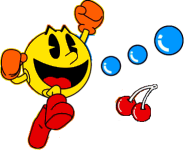 If one of the ghosts is hot on Pac-Man's tail, do not insist on eating more pellets in order to clear the round faster. Get to a clear lane that will provide Pac-Man with as much escape time as possible. 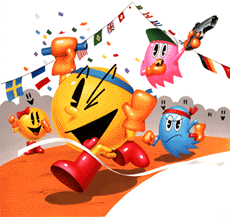 Continuing to eat pellets is a surefire way to slow Pac-Man down and get caught by a ghost. The lowest row of the maze is the most dangerous part of the maze to clear. This long stretch of maze has few escape routes, and is a prime opportunity for the ghosts to gang up on Pac-Man and attack him from both directions. The best time to clear this row out is right at the start of the round, when the ghosts are still leaving the ghost regenerator. Inky is the second-to-last ghost to leave the regenerator, and he immediately heads for the lower right corner. Clyde is the last ghost to leave the regenerator, and he immediately heads for the lower left corner. Clear out as much of the bottom row as you safely can, but get out of Inky or Clyde's way if they start getting close. Another important detail to remember is that Pac-Man can turn corners much faster than the ghosts can, providing another great get-away opportunity. The areas around the sections of the maze that resemble the letter T provide you with a good escape route by zig-zagging through the alleys on either side. But in order to perform this properly, you must push the joystick in anticipation of the next turn ahead of time, so that Pac-Man makes the turn as soon as possible. If you don't instruct Pac-Man to turn as soon as he's permitted, the benefit of taking the corners will be lost. The tunnel is an excellent way to put some distance between Pac-Man and any ghosts that may be hot on his tail. The ghosts are forced to travel through the tunnel at half the speed of Pac-Man. However, it's very easy to overlook another ghost who is slipping into the tunnel from the other end, inadvertently trapping Pac-Man in the middle. So make sure you give quick glance to the other side of the screen before ducking inside and escaping your pursuers. 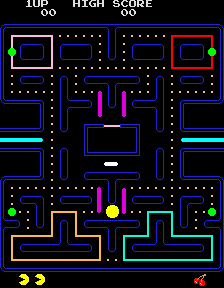 There are two sections of the maze where Pac-Man is permitted to travel through, and the ghosts can't follow. 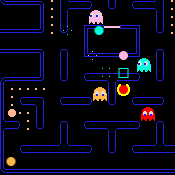 The two T sections immediately above and below the ghost regenerator contain alleys that Pac-Man may enter from the bottom, but the ghosts may not (unless they are blue). Therefore, if you are being chased by a ghost, you can duck down one side of the T and up the other side, and the ghosts will have no choice but to abandon their pursuit. This is a powerful tool that can be used to save your life over and over. The right side of the T-section beneath the ghost regenerator can be used as a safe spot where the ghosts are unable to find and catch Pac-Man. There are two conditions that must be met to make the safe spot work for Pac-Man. The first is that none of the ghosts must "see" Pac-Man enter the safe spot. If they do, they will follow him in there, and the said spot will not be safe. The other condition is that Pac-Man must be facing north. You don't necessarily need to approach the spot from the south (just to the right of where Pac-Man begins the round). You can enter from the east and quickly change orientation to point north. If you meet both conditions, you can leave Pac-Man in that location for as long as you like and move the joystick when you are ready to resume play. Marathon players of the game often use this trick if they need a break from the game. One of the best ways to stay alive is to know how your enemies think. And believe it or not, all of the ghosts have their own individual "personality" or Artificial Intelligence (programmed by Hideyuki Mokajima). That is, they each follow a slightly different set of rules for figuring out which way to turn when moving around the maze. If you're in a tight situation, and it looks like you might be attacked from both sides by two different ghosts, knowing how each of them will react can make a difference between life and death. Refer to the diagram on the right. In this current situation, the place where each ghost wants to reach is indicated by the colored circles. Blinky obviously wants to go to Pac-Man's position (the red circle). Except, he can't reach him because he is not allowed to go up the blind alley that Pac-Man is in. Pinky wants to go to the pink circle on the bottom of the ghost regenerator, which is four grid squares ahead of Pac-Man's current direction. Since Pinky can never actually get in there, he will continue to circle the ghost regenerator, until Pac-Man moves. Inky's logic is a little complicated. The cyan square is the space two grid squares away from Pac-Man's current direction. The place where Inky wants to go is the location that is equidistant from the square in the opposite direction from Blinky's position (marked by the cyan circle). He too will circle around the ghost regenerator until Pac-Man moves since Blinky will never be able to reach him. Clyde is simple. Clyde wants to go the red circle when he is far away from Pac-Man, and he wants to go to the lower left corner (the orange circle) when he is close. Thus, Pac-Man is safe in his current location. When Pac-Man is facing up, there is actually a bug in the code which makes Pinky's target space four up and four to the left of Pac-Man. Similarly, the cyan square that Inky wants to go the opposite of is actually two up and two to the left of Pac-Man. This makes Inky's actual target four spaces to the left of what is shown in the picture. This is due to overflow errors. 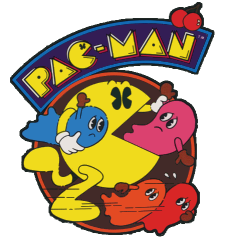 Pac-Man and the four ghosts each occupy one cell, which is used to determine whether the they collide. If Pac-Man and one of the ghosts exchange tiles at the same time, Pac-Man will pass through unharmed. In addition to their preprogrammed behaviors, the ghosts simultaneously enter periods where they must return to their "home corners" for a moment of time. When the ghosts are hot on your tail one moment and suddenly reverse direction the next, this means that they are returning to their home corners. For the next few seconds, not only will they not actively chase you, but you can safely follow them wherever they go. But you should remember that this home-corner behavior only lasts a few seconds before they turn around and start actively chasing you again, so you should use this time wisely and clear out parts of the maze that are otherwise too dangerous to clear, such as the lowest row with its long stretches and few escape routes. When it comes down to it, Blinky and Pinky are the most dangerous of the four ghosts. Blinky tries to attack you by taking the shortest path that he can find to Pac-Man's current position. Pinky, on the other hand, tries to ambush you by moving to the location that you seem to be headed in. Compared to these two, Inky and Clyde just don't have that "killer instinct". Inky won't really pursue you too strongly unless Blinky is around, and Clyde just seems to be in a world of his own. Since Pinky tries approaching the point four squares in front of Pac-Man, it is possible to trick Pinky into turning away. For example, if you just turned an intersection with Pinky hot in pursuit, a quick reversal will distract him into moving in the wrong direction - but this won't always work. In general, Pac-Man's survival depends on staying farther away from Blinky and Pinky, even if it means getting closer to Inky and Clyde. After you grab a power pellet, and if you have the opportunity, you should eat Blinky and Pinky first to keep them out of play for a longer time. Sometimes it can be useful to get ghosts to come closer to Pac-Man. Perhaps you want them to gather around you just before you eat a power pellet, so that you can maximize your point-earning potential. Or perhaps you want to slow them down by luring them into the tunnel so that you can take advantage of the extra time you'll gain while the ghosts are struggling to get through the tunnel. One of the best methods to accomplish this is to wiggle your joystick so that Pac-Man moves back and forth. The more ghosts that see you, the more likely they are to head in your direction. However, you must make sure that the ghosts are not in the "home corner" phase of their behavior before attempting to lure them, as they won't actively chase you. Since the ghosts are more likely to clump together and chase Pac-Man later in the round, it's best to save the power pellets for last. One of the biggest wastes of any scoring opportunity is to eat a power pellet as the last pellet in the round. Even if a blue ghost is right by you, you won't get any chance to eat him for points. If you save a few pellets, near one of the power pellets, and save that power pellet for last, you can consume it, eat as many ghosts as you can nearby, and quickly finish the round by consuming the pellets you reserved for the end. Remember that the ghosts will immediately reverse their direction when you eat a power pellet, so make sure they are as close to you as possible before you eat it, so that you do not have to chase them. Bonus fruits appear just below the ghost pen when you've eaten 70 pellets, and again when you've eaten 170 pellets. And while eating a 100-point pair of cherries is an enjoyable aspect of playing on the very first round, it's nothing compared to the 5000-point keys, that you'll encounter later in the game. Don't risk your life in an effort to collect the lower value fruits if you want to make it to those really valuable bonus items. To the novice, the bonus fruits are merely point opportunities, but to the expert, they are an indication of the very nature of the round you are on. Once you've reached the oranges (Rounds 3 and 4), the bonus fruits usually let you know something about the blue time of the ghosts for that round. With the single exception of the grapes (Rounds 7 and 8), the blue time is always longer throughout the second instance of a fruit than the first. Aside from the fact mentioned above, the ghosts' blue time generally decreases as you reach higher rounds. This means the challenge of earning 3000 points for all four ghosts with a single power pellet is much easier at the start of the game than it is later on. Throughout the game, you must pay special attention when the ghosts begin to blink and flash white. This means that the ghosts will only be scared for a few more seconds before they go back to chasing you. Once you see this, don't continue to chase a ghost if he's still a long way off. You're likely to reach him just in time for him to kill you. Instead, use this time to head for the closest section of the maze that needs to be cleared. The perfect game score is 3,333,360 points, meaning you must eat every bonus fruit, eat all four ghosts with every power pellet, and clear all 255 rounds. The only times you must eat the ghosts is when there is blue time for the ghosts (see above) in the round. This can be extremely hard because you need to memorize the patterns and eat all four ghosts, even if they are only blue for a split second! This will only work if you have chosen to start the game with five lives, and you will also need to eat all the hidden pellets on the split-screen round every time. Note that only the 333,360 shows up on the screen because the score display of early Namco 8-bit games rolls over at 1,000,000. This page was last edited on 28 December 2018, at 16:22. This page has been accessed 160,486 times.